Hijani is considered to most to be short and thin. What stands out mostly is his rather large bald cranium. His eyes are almost unnoticeable, very dark, and almost black. To most he seen as scrawny and very pale. Usually referred to by his last name "Dalbi", Hijani is his actual first name. He is a Celibate as per requirement for entrance in star fleet, but also sees most humanoids as sexually unappealing. Denobulans and Betazoids are particularly interesting to him, having expressed interest in their openness of culture, yet he maintains that the Celibacy requirement should be upheld for the sake of further development. He does, however, find that helping those along with sexual growth is part of his position and the occasional match making has been known to happen. Enjoys creative thinking activities, theatrical acting, and the occasional white wine. Born on Delta along with twin sister, Iali Dalbi. Hijani was the first of other siblings. He grew up the oldest and only son of Jini who led couples counseling and therapy to offworlders seeking help in relationships. Kitea, Hijani's mother, handled the administrative work for the clinic. Hijani and his other siblings helped out as best as they could. Sometimes going through old files and at other times assisting in childcare for the youngest of siblings and children of couples who visited the clinic. 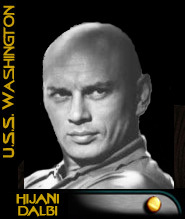 Soon after finishing his schooling Hijani decided to join Star Fleet to carry on in his father's line of work on other planets. He stuck to what he knew best, counseling and childcare. After earning certificates in both he was assigned to the Star Fleet's mental health division where he took on some of the more severe mental health disorders. After a year and a half and a promotion to petty officer third class, he requested a position on the family counseling team aboard the medical specialized star base 2. He three years aboard the station and rose two ranks before going back to the academy to earn a degree in psychology. He was transferred to the USS Washington after completion of the Academy and a two-month extended leave to visit his family on Delta.